At the Automobility 2016 event at the Ford Motor Company Conference & Event Center, Dearborn, Michigan, on October 13, Ricardo will publish a white paper that details the importance of safety case development to support the public introduction of autonomous mobility, based on the pioneering international work of Ricardo Rail in ensuring the safety of autonomous vehicles on both the railway and highway. Automobility 2016 – Reimagining Transportation – will provide an open forum for all participants to share ideas in assessing the challenges and opportunities as autonomous cars, connected vehicle technologies and advanced mobility services revolutionize the auto industry. In addition to focused sessions with leading experts examining design, technology, regulatory and business issues, the event will culminate in a unique, interactive exchange among technical and industry panel members, and delegate attendees. The summit is targeted at company leaders at a time when the traditional value chain of automakers and suppliers are vying with a host of new competitors to transform how people and goods will move within and between cities. 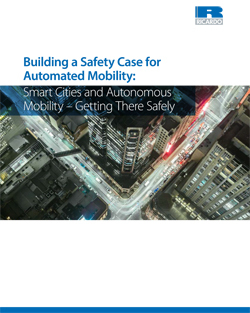 Given the importance of this event, Ricardo has chosen to participate as a Gold Sponsor of Automobility 2016, and will be publishing a new white paper to coincide with it: Building a Safety Case for Automated Mobility: Smart Cities and Autonomous Mobility – Getting There Safely. The white paper Building a Safety Case for Automated Mobility: Smart Cities and Autonomous Mobility – Getting There Safely will be available for download at: www.ricardo.com/connected following Automobility 2016.